The Heart of the Issue: The Fight Over Public Lands | RANGEfire! 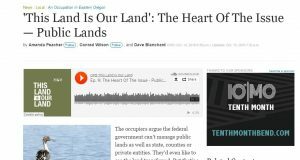 Listen to the OPB Podcast: The Heart of the Issue — Public Lands. Note: We’ve said it before and we’ll say it again, here at RANGEFIRE! we have no interest in being a single-dimensional echo chamber. We acknowledge that there are always multiple sides to every story. In the West, there is an old saying to the effect that: “good fences make good neighbors.” At RANGEfire! we acknowledge our virtual neighbors on this virtual landscape. We think it is important for people to have an opportunity to hear all sides of the story, and know what others are saying about these issues. So we often share what others are saying. In this case OPB shares Keiran Suckling’s extremist view of the “catastrophic disaster” that will occur if the Defendants in the Oregon Standoff Trial are aquiitted, and what that will mean for public lands in the West. They also discuss the whole “Public Lands Transfer” issue.